If you’re like me, maybe you have a pile of posts in your WordPress database. I have 3426 posts in here. It’s a giant database of stuff. Good stuff, bad stuff, short stuff, long stuff. Slicing and dicing that content in a way that makes sense, or that allows you to find what you have written and posted before is tricky. Sure, you can use Google by adding “site:artlung.com” to your search query and get fairly good results. But for some things, wouldn’t it be great to be able to find things. 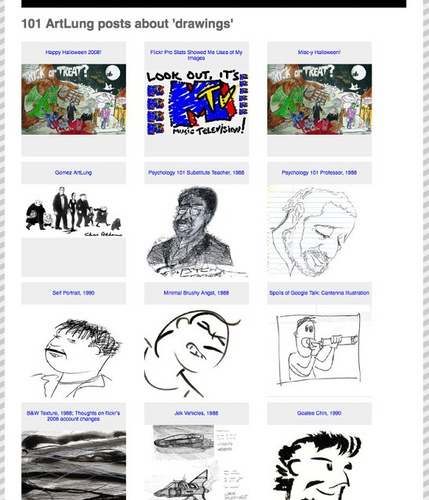 So in my effort to build a WordPress theme that suits me perfectly (I’m calling the theme “roanoke”), I’ve added a feature to provide thumbnail images for all my posts tagged with “drawings” — see http://artlung.com/blog/tag/drawings/. I’m using a plugin called get_the_image, which can use the explicitly added “Post Thumbnail” feature if it’s there, OR use a few different other techniques. But mostly, it can analyze the currently referenced post and extract out the url of the first image being referenced. This is not perfect, as sometimes what it finds is a huge image, or maybe the first image is not the best image, but it still works pretty well. The plugin was originally written in 2008 (!) but works great for me. Now, you’ll notice that I hardcode the path to the image, and I’m not using the original image itself, but referencing a copy that I put into my ‘wp-content/uploads’ folder. For now, this works fine, though I really think something that automates grabbing the images, and automatically generates an appropriate thumbnail (I’m using 200 pixels wide) would be best. 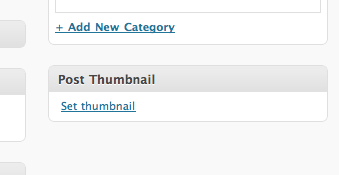 So if I make a new post with the tag “drawings” now, I also have to do the legwork to make a new thumbnail. I also have to be mindful of filenames. This is not a problem for me since I am always extremely sensitive to prefixing filenames with dates, and flickr is too. Since these are my sources, it all works out pretty well. Comments, ideas, and suggestions are welcome. See it for yourself! Joe Crawford blogged this at 9:18am in 2010 in March. The 27th was a Saturday. You are reading this 9 years later. Comment. There is one comment Tweet. Send email. It has hashtags→ programming tags webdev wordpress .